"Deadly Creatures" opens with a vague recounting of the events that befell the game's only human characters, two would-be treasure hunters voiced by Dennis Hopper and Billy Bob Thornton. Thornton's crawling narrative delivery, intercut with a cryptic sequence of murky scenes, instantly sets the tone pervasive to the game: dark, sinister and strangely compelling. Though the human story is a classic morality tale of greed and betrayal, what makes "Deadly Creatures" unique is that it's not told from the perspective of humans at all, but rather from the dispassionate perspective of nature. There are no heroes in this game. The true protagonists, a tarantula and scorpion, can at best be described as morally neutral, their chief concern strictly pragmatic: survival. Placing the player in each roll in alternating chapters, it is through these cold-blooded eyes that "Deadly Creatures" tells its tale. And Rainbow has done exceedingly well in the telling. 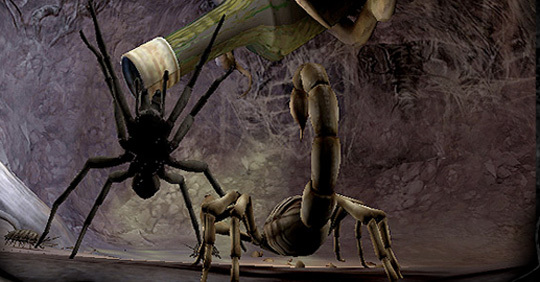 From concept to graphics to sound to gameplay, "Deadly Creatures" fully immerses the player in the kill-or-be-killed world of desert arthropods. Graphically, the game pushes the limits of the Wii's capabilities. Its detailed environments, textures and animations present a realistic world rendered in a scale unfamiliar to human eyes. Everyday objects are at first unrecognizable, but serve as a frequent reminder that this alien world is our world, too. The effect is only heightened by the game's sound and original score. The subtle scuttling of claws across sand, the crunch of a beetle's carapace in your pincers, the juicy squish of a grub in your fangs, the organic rise and fall of the music -- everything coalesces to create an atmosphere as unsettling and fascinating as any Wii game yet created. None of this is diminished during actual gameplay. 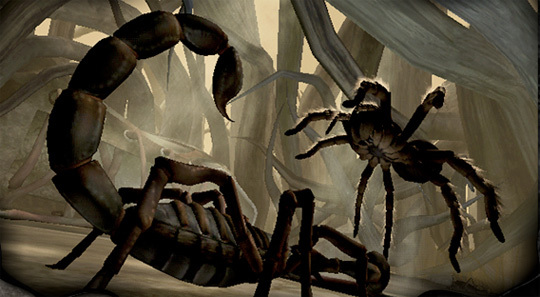 In "Deadly Creatures," the controls are remarkably intuitive, particularly when assuming the average player is unlikely to have spent much time previously pretending to be a tarantula or scorpion. Playing with the Wii Remote and Nunchuck, basic movement is controlled with the Nunchuck thumbstick, basic attacks with the A button. As the game progresses, the player is rewarded with new moves and, turn by turn, waggling, aiming and the full array of available buttons and triggers are added to one's arsenal. Be advised, however, that this is no button-masher, successful attacks rely on the careful orchestration of motions and buttons, and just what combinations of waggles you'll need will depend upon which creature you're playing. With its ranged and leaping attacks, the tarantula seems better suited for a stealthy, tactical approach, while the scorpion seems a slower, sturdier melee/bruiser type. Alternating between the two each chapter was a particularly clever move on the part of the developers, providing a sense of balance and preventing the gameplay from getting stale. As easy as it is to gush about the game, "Deadly Creatures" is not without its flaws. The quality and complexity of its graphical elements eventually result in some loading lag when multiple foes enter a screen. While brief, these delays are significant enough to impinge upon the pace of the game, break its immersive spell and allow the player to become suddenly aware of the absurdity of feverishly waggling a Wii Remote at an unresponsive screen. Despite the numerous attacks and maneuvers one accrues, boss battles in the game boil down to a series of quick time events. Depending more upon timing and the interpretation of onscreen symbols than strategy or skill, these battles quickly become repetitive and frustrating. And, for all the game's immense potential, its final chapter feels oddly anticlimactic and unsatisfying. Flaws notwithstanding, Rainbow Studio's "Deadly Creatures'" is a game absolutely not to be missed. Its unique perspective; unusual narrative structure; and completely immersive, atmospheric visuals, sound and gameplay make it a landmark game for the Nintendo Wii.